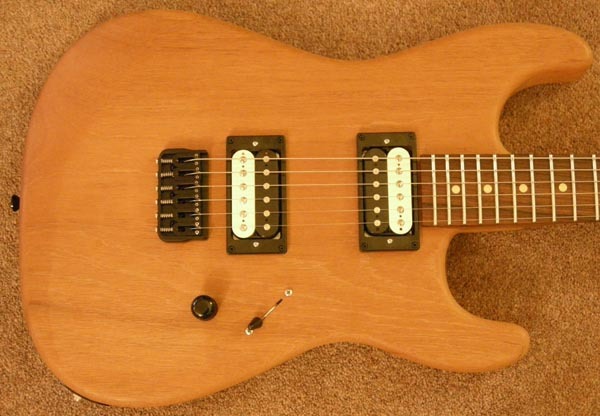 Stormshadow SS0008 is built from a 1 pc Mahogany Body with Pau Ferro neck & board. With a Hipshot stringthru hardtail bridge and Sperzel locking tuners. The finish is natural wax, so the quality of the woodwork has to be bang on. The quality off the woodwork is top class with not a single flaw to be found anywhere. The feel and playability is superb, the neck profile and fretting mean this guitar is easy to play and you start to forget its there at all. The action supplied was a little on the low side for me, so i had to raise it up a tad, but thats all. Tonally it is something special, acoustically it rings like a bell & sustains forever. The pickups are Stormshadows own and are on the Hot Vintage side of things. With plenty of clarity and bite. They love gain but also cope well with clean and lower gain sounds very well. The Megaswitch P also provides some cool strat like split sounds. The guitar has received compliments everywhere ive taken it, on both its looks and sounds....even from drummers. All told, i couldnt be happier with it. Cheers Rich! !